Yardley Dermatology Associates treats patients with an equal dose of compassionate care and state-of-the-art expertise - Times Publishing Newspapers, Inc.
People with skin and dermatologic disorders, from common to complex, chronic to rare, or cosmetic to age-related, often describe how the condition can negatively affect their daily life until it is successfully treated, managed or resolved. 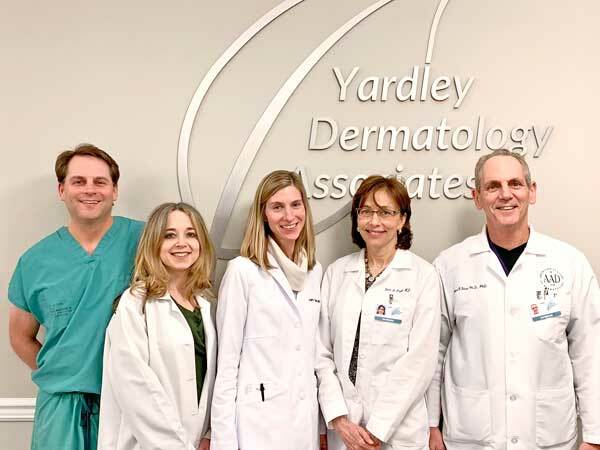 Yardley Dermatology Associates and Skin Enhancement Center cares for patients of all ages with skin problems of any kind to greatly reduce or eliminate the impact skin conditions frequently have on a person’s emotional and psychological well-being. “One of my areas of expertise is the interface between the skin and the mind,” explains Rick Fried, MD, PhD, a board-certified dermatologist and clinical psychologist. He founded the practice with his wife, Fern Fried, MD, who is board-certified in internal medicine and dermatology and specializes in acne treatment, cosmetic dermatology and skin rejuvenation. “It has been known for many decades now that many common skin problems are made much worse by stress. Conversely, living with many common skin problems can be very stressful,” he notes. Examples of common skin problems may include acne, psoriasis, rosacea, hives, eczema, allergies, fever blister outbreaks or skin cancer. Other skin problems are categorized as” life spectrum” disorders such as wrinkles, brown spots, warts, spider veins, moles, unwanted growth, or changes in the skin’s feeling, appearance or sensation. “Our practice has maintained from day one a more holistic approach. We don’t see the ‘rosacea patient.’ Rather, we see the person who happens to have rosacea. What distinguishes us from other dermatologic practices is that holistic philosophy. In our practice, the person matters and what matters to that person is important to us too. We’ve been enormously fortunate in that all of the clinicians that have joined us are like-minded,” he says. The clinical staff includes eight board-certified dermatologists providing medical and surgical treatment for most skin, hair and nail disorders. The practice also has two certified physician assistants specializing in dermatologic conditions and two licensed medical estheticians trained in skin care and cosmetic treatments including laser. The medical staff and physicians regularly participate in formal peer presentations, equivalent to “Grand Rounds” at major medical centers, as an interactive approach for sharing expertise and emerging treatment options and as an added benefit and service to their patients. Yardley Dermatology Associates is a major outpatient surgical center in Bucks County for patients requiring Mohs Micrographic Surgery, an advanced surgical technique for treating skin cancers including squamous cell and basal cell carcinomas. As an active clinical trials center, Yardley Dermatology Associates participates in ongoing research studies for acne, psoriasis, rosacea and cosmetics such as injectable fillers and Botox. The physicians and clinical staff also train medical students from local academic medical centers. “We incorporated clinical trials and clinical teaching into our practice as a way to stay well-informed and experienced with the latest medical and surgical treatments, advanced technologies and therapeutic approaches,” Dr. Fried says. Yardley Dermatology Associates was recently recognized by the Bucks County Courier Times as “The Best of Bucks” Dermatology Practice in 2018. “It is a very comfortable place for us to work together because we all do what we are passionate about. It is an exciting time right now with the major advances being made in treating skin cancer, psoriasis, rosacea, eczema and skin rejuvenation. We love our work and we love caring for our patients and their families. We’ve cared for several generations of families here. Our patients are just wonderful people,” Dr. Fried adds. Yardley Dermatology Associates is located in Yardley at 903 Floral Vale Professional Park. The Mohs Surgery Center is located at 803 Floral Vale Professional Park. Office hours are Monday and Tuesday 8:00am to 7:00pm, Wednesday 8:00am to 4:00pm, Thursday 8:00am to 6:00pm, and Friday 8:00am to 3:00pm. For more information or to schedule an appointment, call 215-579-6155. To contact the Mohs Surgery Center for information and appointments call 267-759-6240. Visit www.yardleyderm.com for more information. “Like” them on Facebook @yardleyderm. PHOTO CAP: The partners at Yardley Dermatology Associates, Carmen Campanelli, MD, Lauren Sternberg, MD, Judith Cenci, MD, Fern Fried, MD, and Richard Fried, MD.